Rowland was born at Halstead, Essex, England, on 2 August 1892, the only son of Frank (1865-1944) and Emmeline (1866-1938, nee Orwin) Piper. Rowland was educated at the English College at Lisbon, Portugal, where his father was a schoolmaster who ran a private boarding & day school from 1896–1910. In 1910 the family came out to New Zealand where Rowland’s father obtained his teaching registration, and began teaching as headmaster at Orari. By 1919 he was headmaster at Fairlie, and later took up the same position at Geraldine. Shortly after arrival, Rowland himself became a farming cadet with Mr R.J. McKeown of Tycho, and later worked as a farm hand for Mr W.O. Morrison. 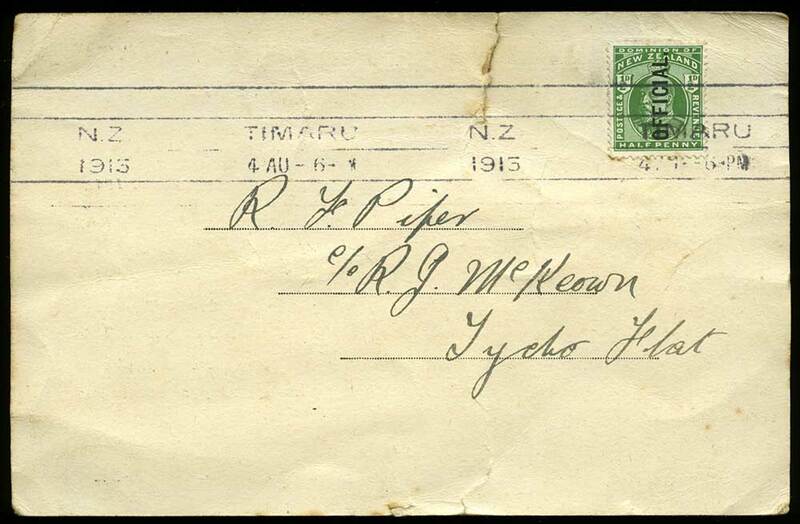 He was still there when he enlisted at Timaru on 25 August 1915, giving his address as care of R.J. McKeown, Tycho Flat. 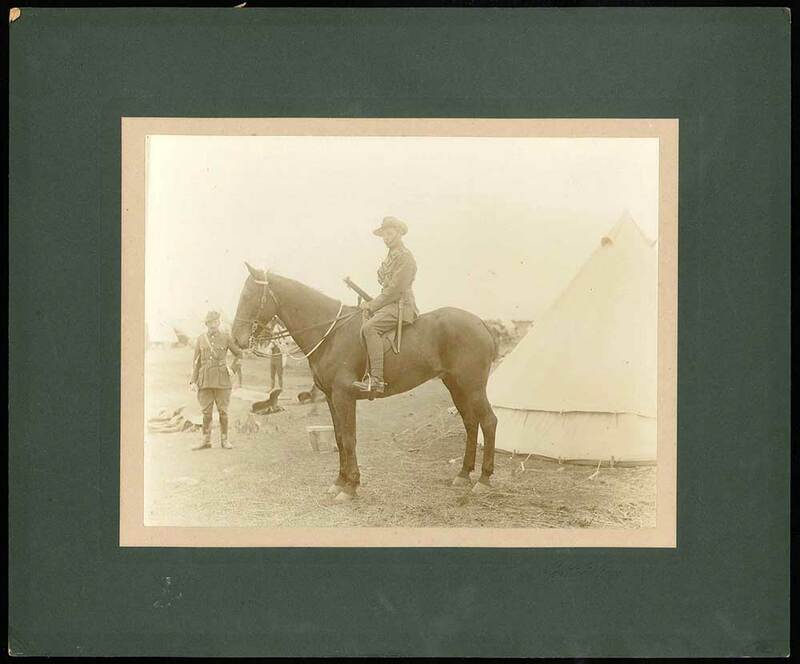 Before his enlistment he had been serving with the 8th South Canterbury Mounted Rifles, rising to the rank of Corporal. On Friday 6 August, at a large enthusiast gathering at the Tycho School, Rowland and Tom Barbour (another local lad) were each presented with a wristlet watch. His parents along with his sister Marguerite, Uncle Mr R. Orwin and Cousin Frank Orwin, were also present at this gathering. His father Frank, Schoolmaster Orari, was nominated as his next of kin, and he was described as being aged 23 years, single, Anglican, 5 foot 8 ½ inches tall, weighing 133 pounds (60kgs), with a chest measuring 32-36 inches, fair complexion, grey eyes, with light brown hair and good teeth. 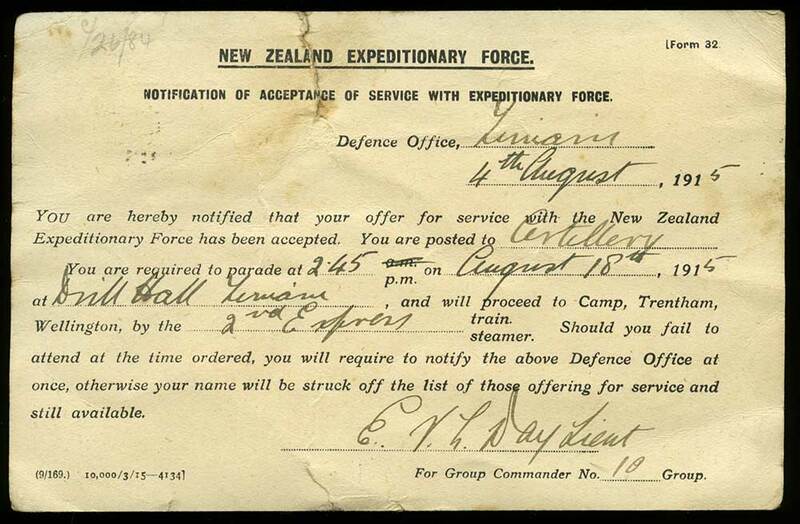 Rowland left Timaru on 25 August on a special train with the rest of the local members of the 8th Reinforcements, joining others from Southland and Otago and later picking up the Ashburton men on their way to the inter-island ferry. 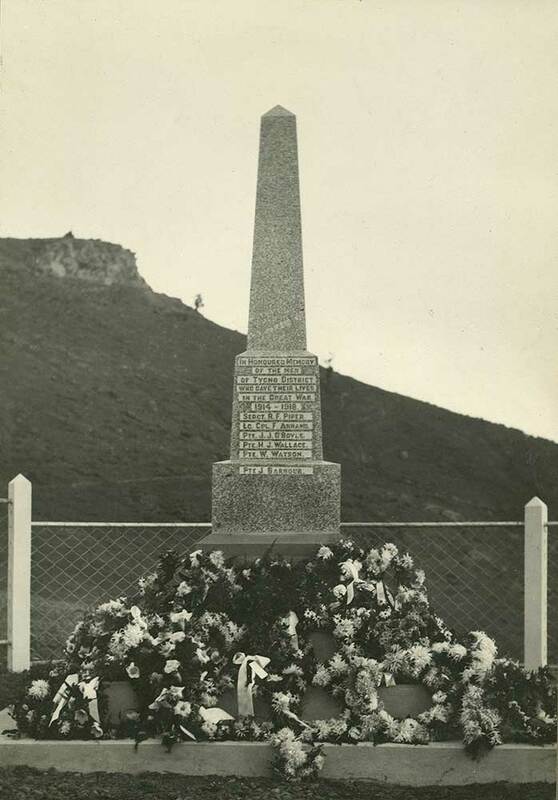 Initially Trentham Camp was where basic soldier training in drill, musketry etc was undertaken, followed by later camps at Awapuni (Palmerston North), Tauherenikau, and other local areas where Rowland received specialised artillery instruction as he had been assigned to the Field Artillery. After training was finished the men were issued with their full uniform and granted a short period of embarkation leave. Finally, after the usual march through the streets of Wellington, on 13 November 1915, the men of the 8th Reinforcements of the NZ Field Artillery (NZFA), and the 2nd Reinforcements of the NZ Rifle Brigade (NZRB) boarded HMNZT 35 “Willochra” where they left for Suez, Egypt, in convoy with HMZNT 36 “Tofua” - a combined total of 2,585 troops. The ships had a stop at Hobart and Albany, where they had a route march through the local area to stretch their legs, before continuing onwards to Colombo for refuelling, arriving at Suez on 18 December 1915. Rowland’s unit then travelled by train to Moascar, which was merely a railway siding a mile from Ismailia on the banks of the Suez Canal. Advance parties were proceeding with the establishment of a big camp where the Division was to be once more concentrated under canvas. With the arrival of the Infantry Brigades, the artillerymen with their horses and guns, other divisional troops, and the supply and transport services, the camp took on an air of bustle and animation. The men gradually settled down into the routine of further training. On 18 March 1916, Gunner Piper was posted to the NZFA 13th Battery, and then promoted to Bombardier on 28 March. On 7 April he embarked from Alexandria for Marseilles, France. As units came ashore they were packed into long troop trains, setting off on their journey northwards through the heart of southern France to a Divisional Area where training camps were established. Sent to the Flanders region to gain experience of new trench conditions, they spent the next three months guarding a ‘quiet’ sector of the line at Armentieres, before moving south to the Somme battlefields, where they were to have their first large-scale action on the Western Front. From there the unit was heavily involved in the actions at Messines and the third battle of Ypres. Further promotion followed up to Temporary Sergeant came for Rowland on 12 November 1917. Throughout December the enemy artillery was continually active - only a few days after his promotion Rowland was killed in action on 8 December 1917 at Ypres when a shell came through the roof of a dugout, killing four of the five men within it and dangerously wounding the fifth man. A further report appeared in the Timaru Herald, dated 27 February 1918, continued in a similar vein, noting that he had been recently promoted to temporary sergeant, how popular he was with his men, and that the major of his battery had recommended him for a commission. The day after his death, the four killed were buried by the Church of England padre, and they lay beside each other in the Divisional Cemetery in Belgium. 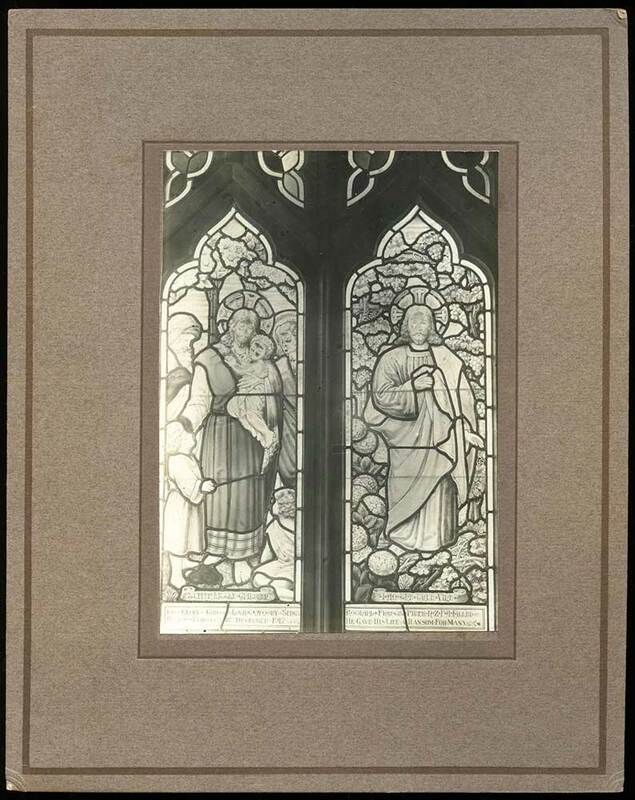 Rowland’s name is commemorated locally in a memorial window at St Stephen’s Church Fairlie, on the Taiko War Memorial, and the Timaru Cenotaph Memorial Wall. After the war his parents received Rowland’s three war medals, the 1914-1915 Star, British War Medal and Victory Medal, along with a scroll and plaque to recognise his service and sacrifice.